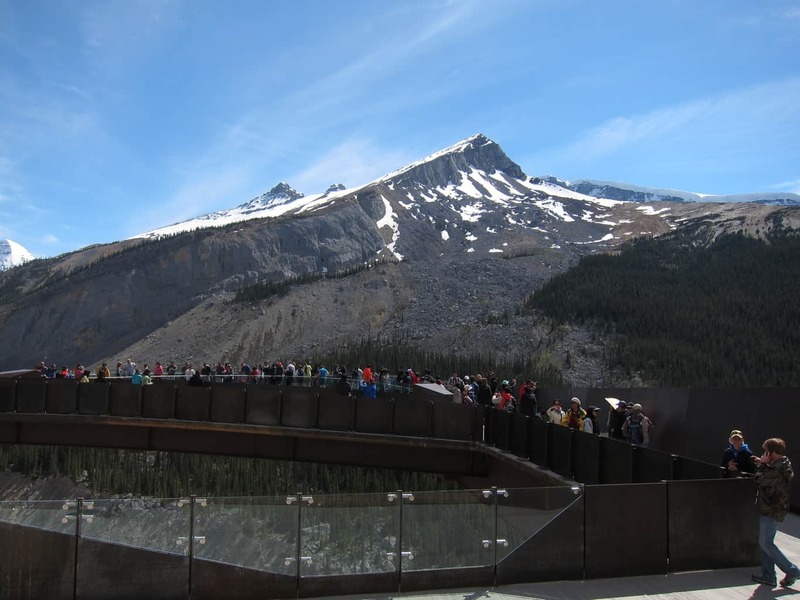 After exploring the Columbia Icefield, we returned to the Visitor’s Center and went on the shuttle bus that transported us to our next destination, the Glacier Skywalk. 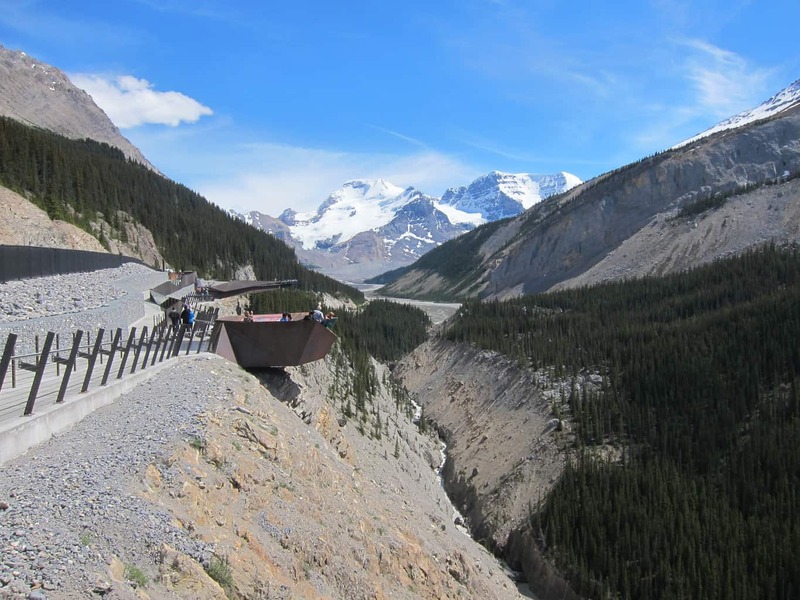 It is the newest tourist attraction site in Jasper National Park, which allows visitors to walk on a glass-floored observation platform and look straight down to the rugged Sunwapta Valley 280 m below! At the receiving area, you could see the trail winds its way along the edge of the cliffs, offering a perfect spot to enjoy the stunning view of the surrounding mountains. As you walk along the trail, you could tune into 60 different audio points to learn about the ecology and geology of the surrounding region. As you may have guessed, we were too distracted by the magnificent view that little attention was given to the educational tour. On the opposite side, you see the spectacular view of the mountain ranges. 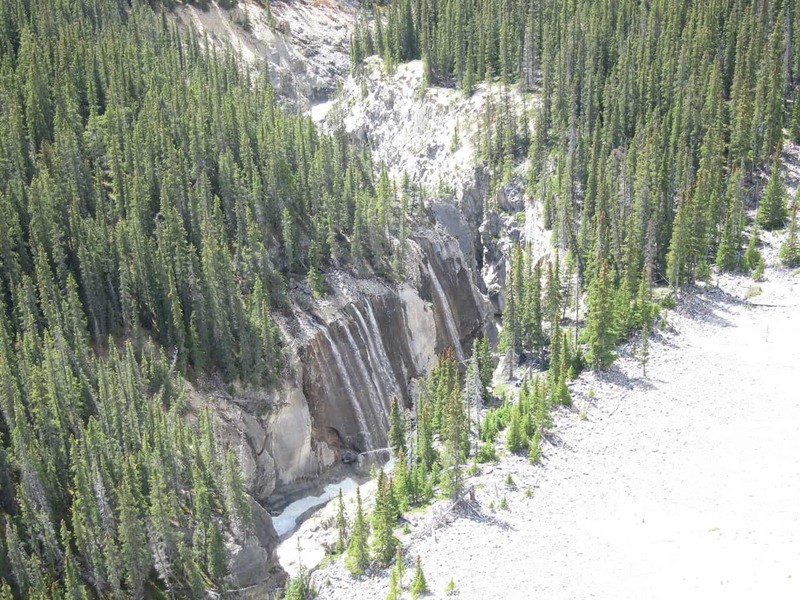 Looking down, there are rushing waterfalls. 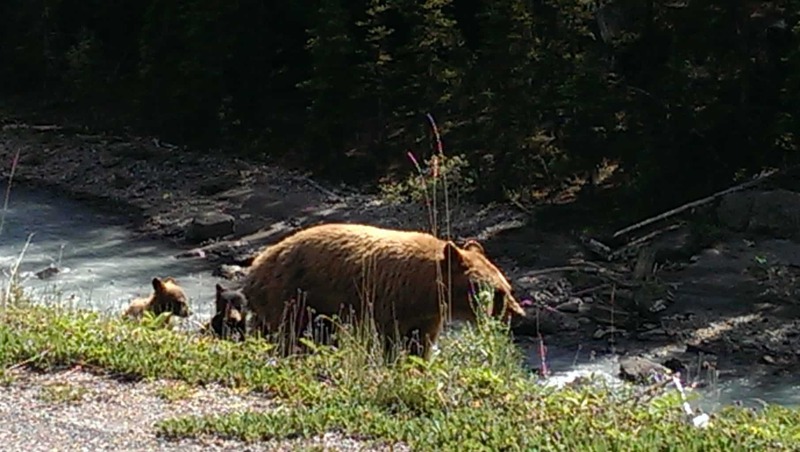 At times, you might see wildlife like mountain goats, bighorn sheep, elks, moose, or bears. 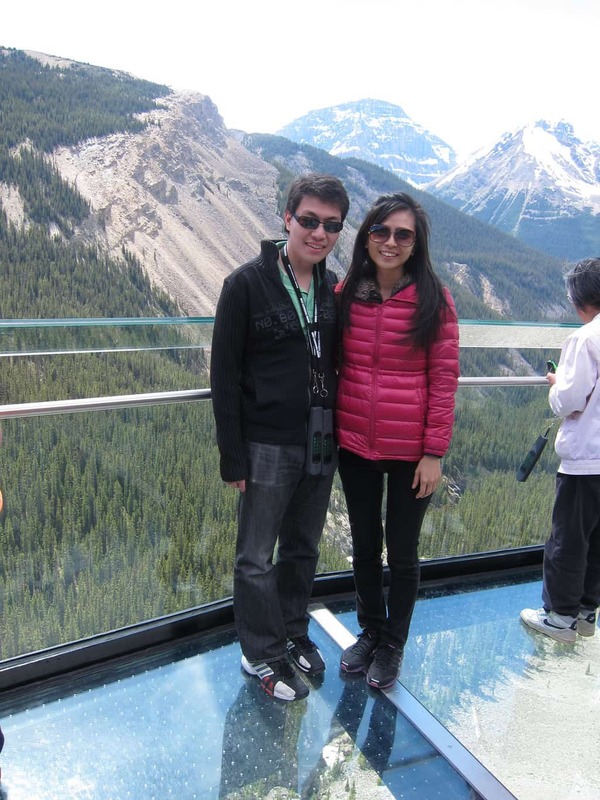 Immediately after, we arrived at the glass deck, which extends 35 m from the cliff’s edge. 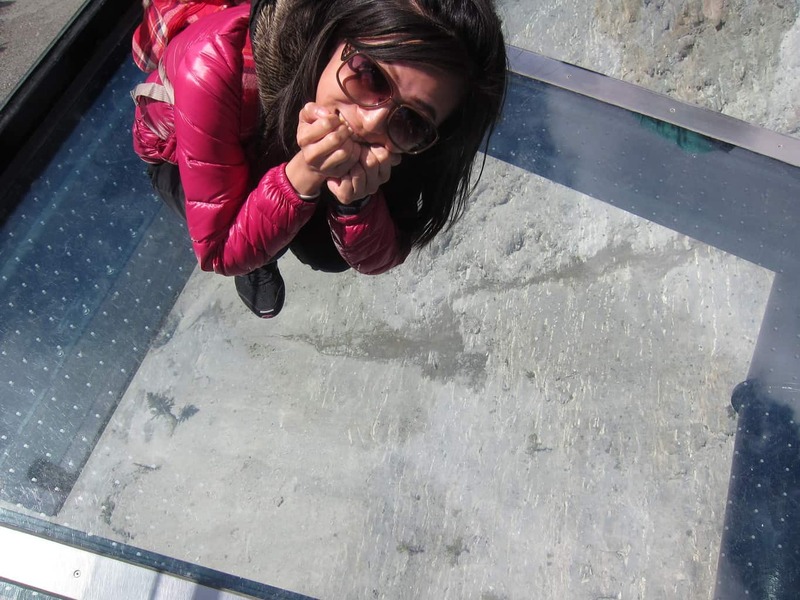 Although I am not acrophobic, the illusion of walking in the air made my knees go weak. If you stand/sit still, you can actually feel the floor shaking!! No matter how scary it seemed, we tried to take as many photos as we could to capture these incredible memories. Haha! Kev’s 2nd attempt to do an awesome pose- falling into the valley. If you don’t listen to the audio guide, it will talk about 10 minutes to finish the whole trail. 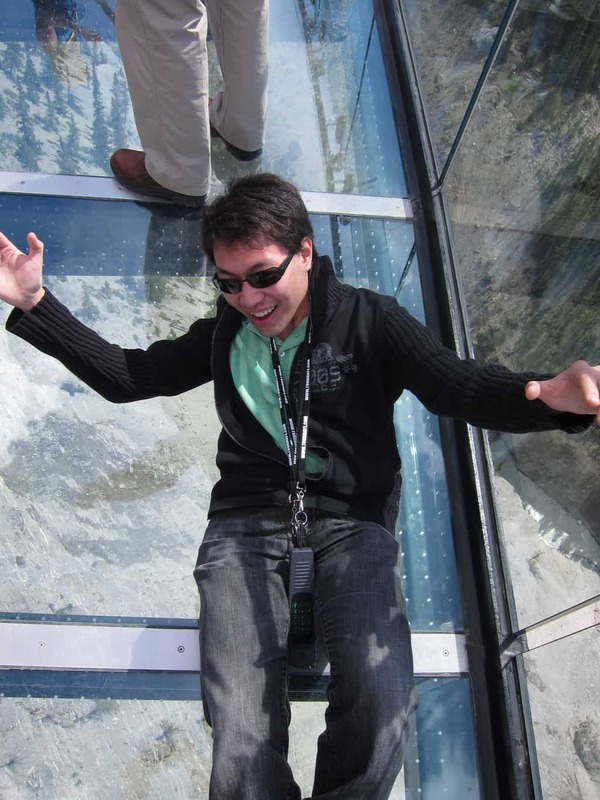 The adult ticket for the Skywalk costs CDN$24.95 (plus tax)… not cheap, but it’s a unique way to explore the Canadian Rockies. 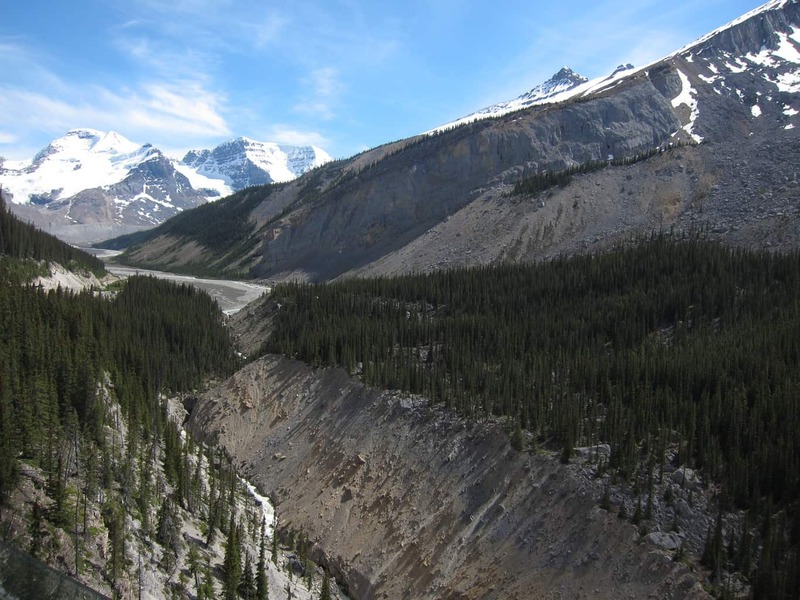 After our tour to the Columbia Icefield and Glacier Skywalk, we took the original road back to Banff. It is not uncommon to see wildlife in rural Alberta. I often heard people saying they saw such and such animals when they visited Banff. Since the beginning of our trip, I had been so excited about any possible animal encounters. I didn’t dare to fall asleep because I was afraid I might miss the precious moment. And guess what? God heard my prayers! 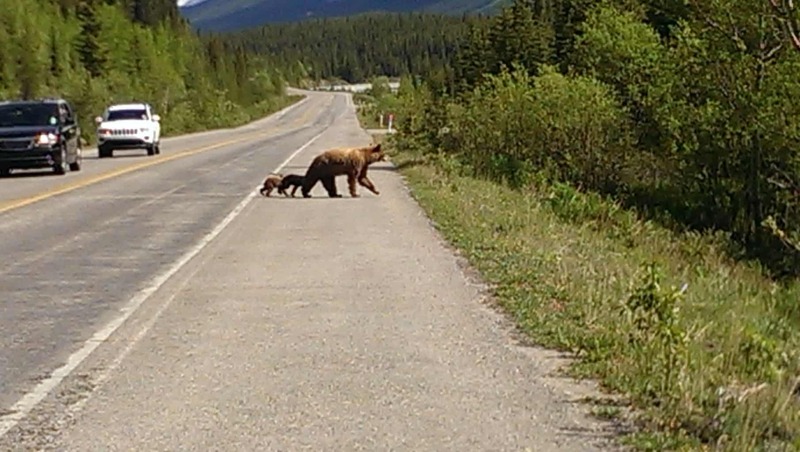 We saw 3 black bears crossing the road XD One mother bear and two little cubs. Awww, so cute! All the vehicles stopped right away to let them cross the road. In the meanwhile, everyone took out their camera/smartphone/ipad to capture this invaluable moment. As a reminder, please do not feed any wildlife. It is not only unlawful to do so (max fine CDN$25,000), it will also hurt the bears in the long run. When you feed them, they learn that as long as they follow humans around, they will get fed. So why bother hunting for food everyday? They will start relying on humans and invading human’s territories to increase interactions with us. In the end, we often have to kill them to protect ourselves. Very sad. 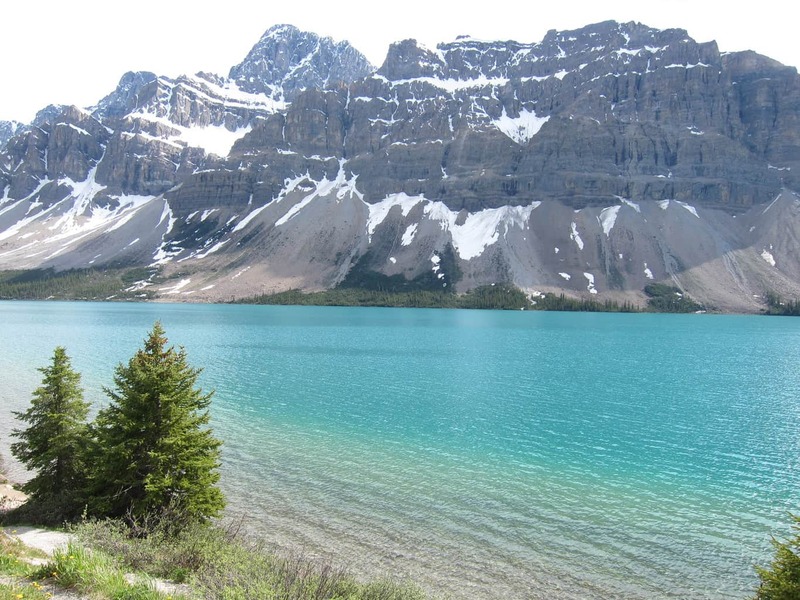 Moving along, we slowly approached an incredibly beautiful, turquoise lake, which is known as the Bow Lake. It is a glacier-fed lake with an area of 3.21 sq. km. 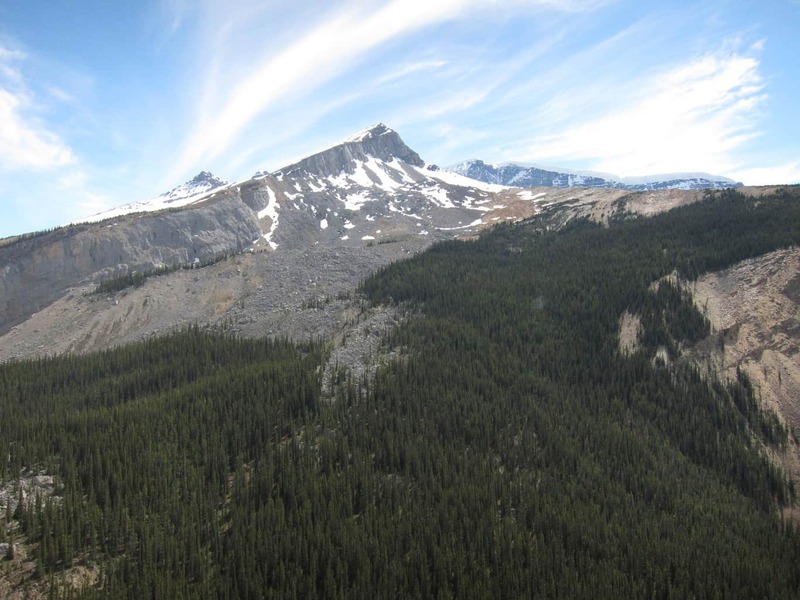 From here you can view the majestic Crowfoot Mountain and Bow Glacier. 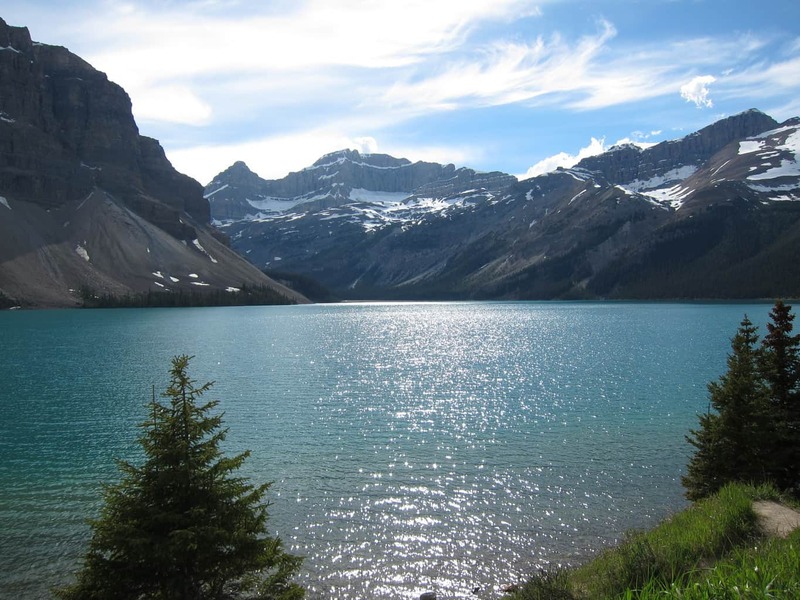 Besides being one of the most scenic lakes on the Icefield Parkway, it is also a popular location for unguided fishing. 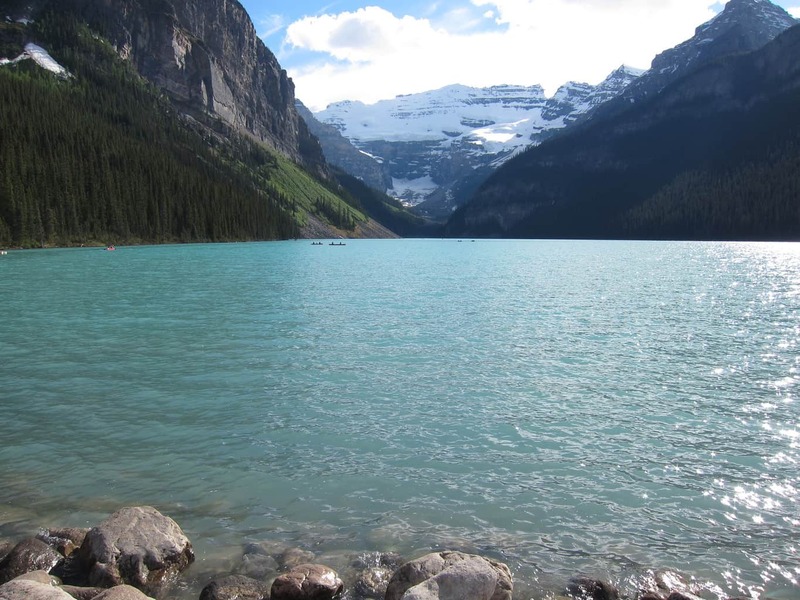 Before arriving at Banff, we made a quick stop at the famous Lake Louise. 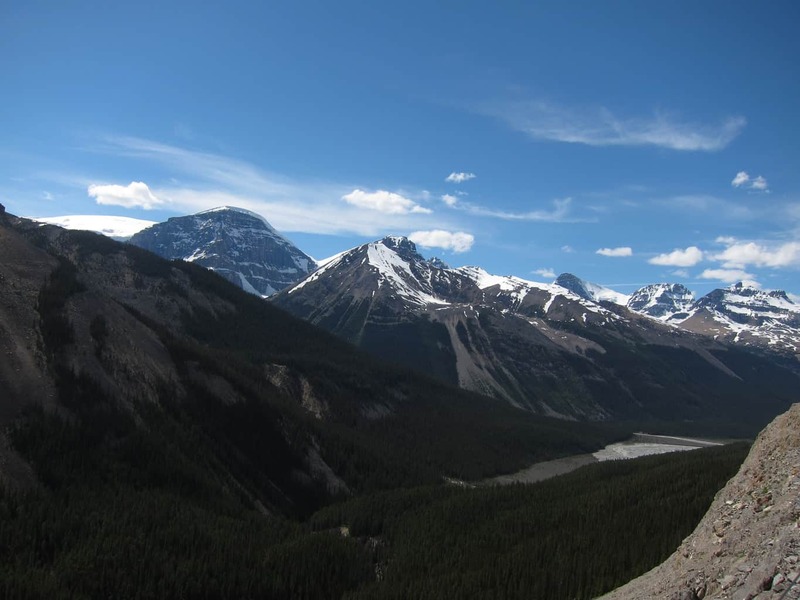 It is a “must-see” attraction in Banff National Park. The glistening, indigo blue water, surrounded by soaring mountain peaks, the majestic Victoria Glacier and a beautiful chateau, provides a marvelous scenery. 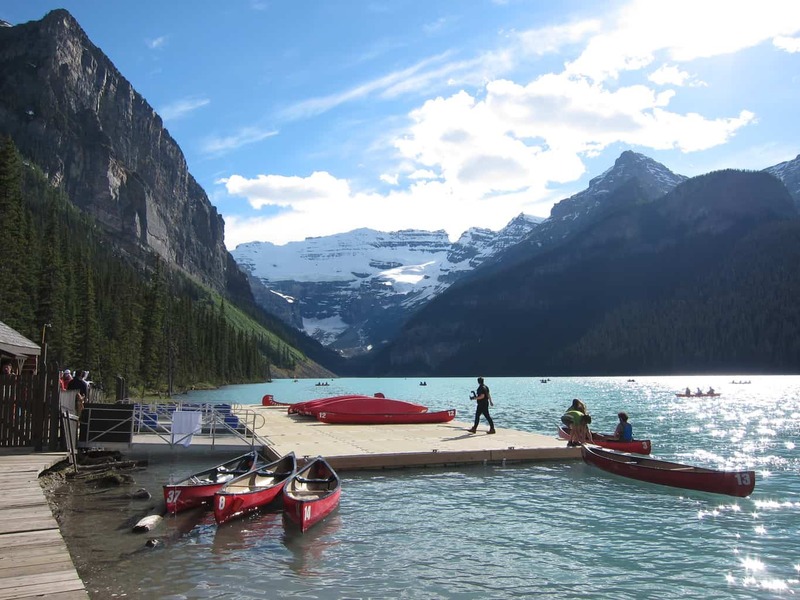 Lake Louise is an outdoor enthusiast’s paradise where you can rent a canoe, go on a hike, enjoy horseback riding, or ride on the gondola. Are you enticed by the beautiful scenery? 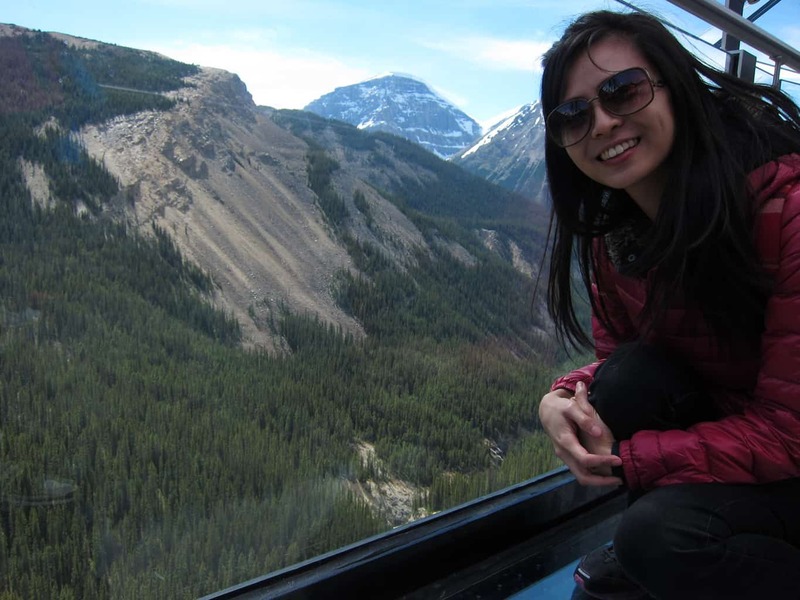 In my next post, I will share more stories about our stay in Banff National Park. Stay tuned! This post is part of the #WeekendWanderlust linkup. I would like to extend my appreciation to A Brit & A Southerner and other co-hosts. For more travel posts, please click on the image below~ Happy Friday, everyone! Wow, this place is gorgeous, cold, but gorgeous, I would love to visit. Can you visit in the winter as well? That looks like an amazing place. One more thing on my bucket list 😉 Thanks for sharing. Thanks for stopping by, Stef! 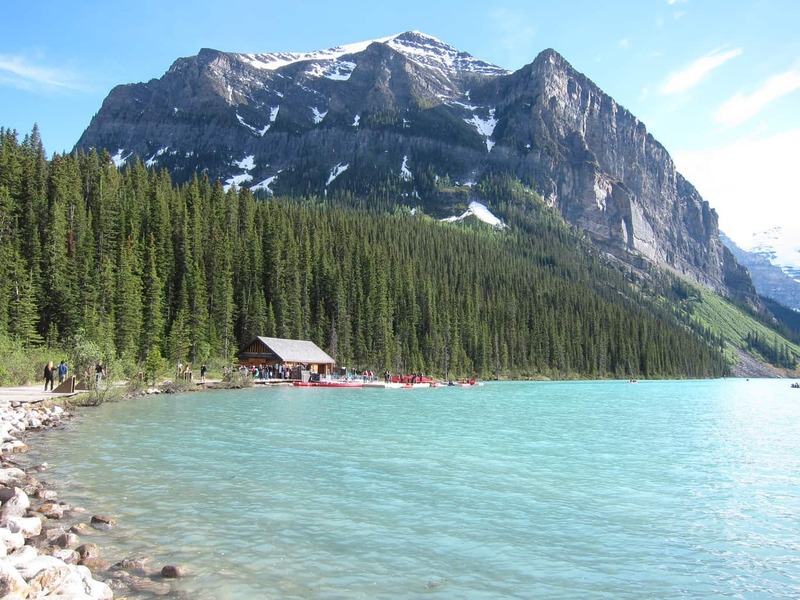 It is such a beautiful place which you must go if you’re ever in Canada!! 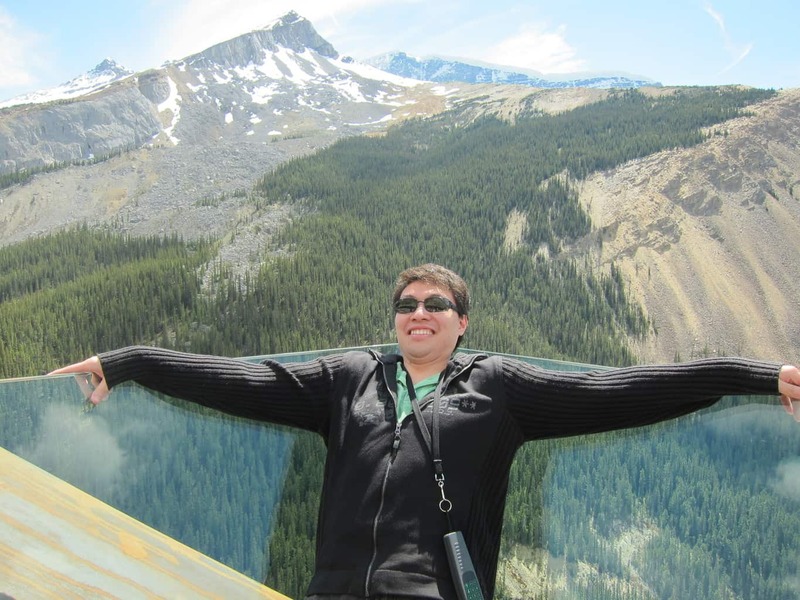 There’s so much to see in Canada!! I would like to go to the territories in northern Canada one day ? 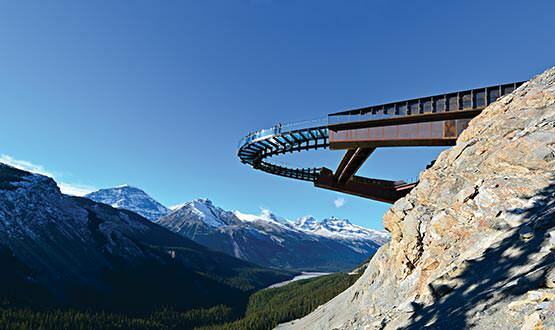 Absolutely beautiful and it’s awesome they installed this walkway for an even closer view of the mountains and glacier! I can’t wait to travel here someday. And those bear cubs are so adorable!!! Thanks so much for linking up with #WeekendWanderlust! 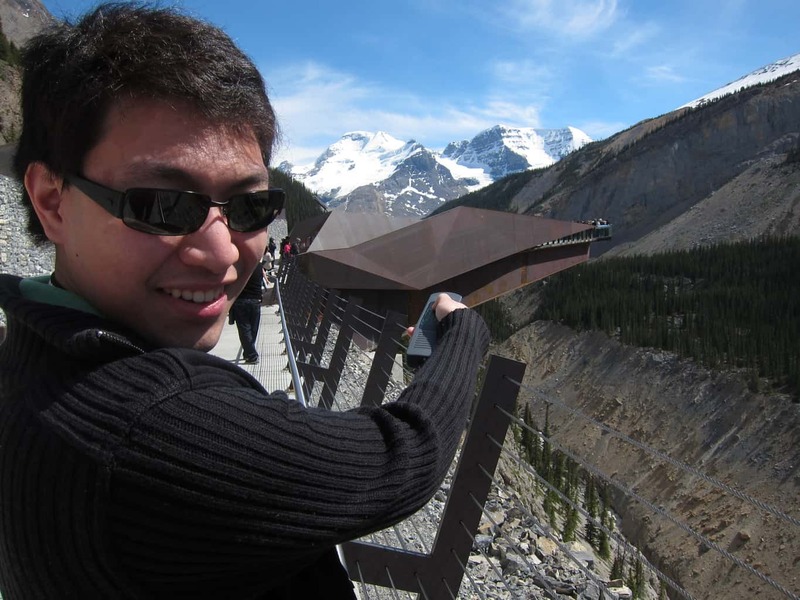 My friends went to Lake Louise a few months ago and loved it. The water is so clear. The Glacier Walk would probably freak me out since I’m scared of heights. Seeing the bear crossing the road would of been the highlight for my kids. Thanks for linking up to #WeekendWanderlust. Hey Carmen! Seeing the bear was also the highlight for me. Especially now that most of us live in cities, spotting wildlife is an exciting encounter ? Always good a good rule to live by – don’t feed the bears! The skywalk looks super cool. Somehow, pictures don’t do justice for vertigo and the ground cracking beneath your feet. 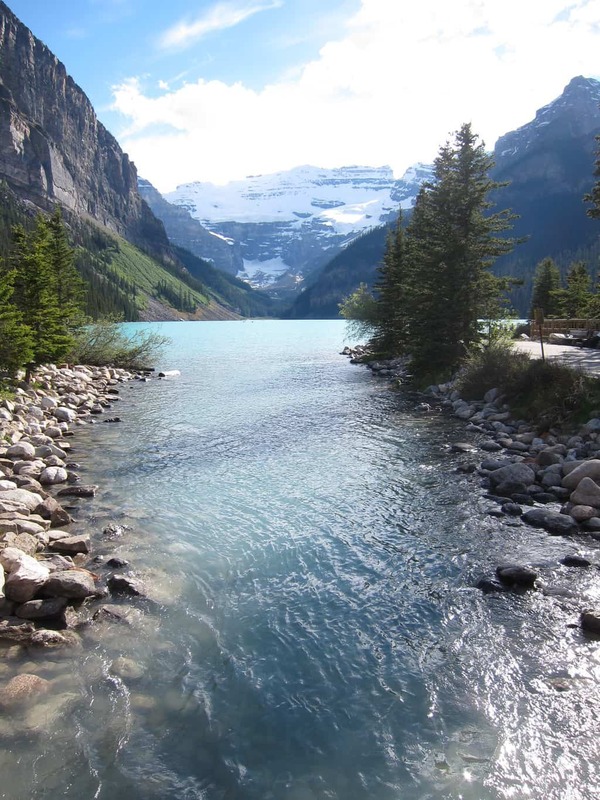 Jenn has been to Lake Louise but it’s still high on my to-do list.